Browsing for posts tagged celery. The other day at Fred Meyer we saw acorn squash on sale for 50 cents. Although neither of us had ever tried acorn squash, I had just read an article in Edible Portland about various types of squash, and we have also been wanting to cook more seasonally: which means lots of root vegetables for fall / winter. 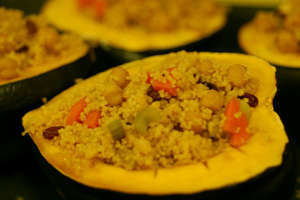 After browsing a few acorn squash recipes online, we decided on Moroccan-style stuffed acorn squash. In this simple recipe, the acorn squash is stuffed with a mix of couscous for sustenance, garbanzo beans for protein, carrots and celery for crunch, and finally raisins for a little bit of sweetness. This sweet and salty stuffing combines wonderfully with the flavorful creaminess of the acorn squash.